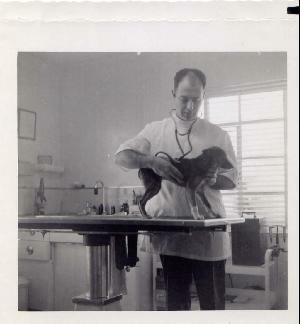 The Huntington Animal Hospital was created in 1952 by Dr. Mort Kramer (left). He graduated from Middlesex Veterinary School in 1945, and moved to the present location of the hospital a few years later. The pictures below are of the little red brick house at 113 Walt Whitman Road that eventually became the hospital that we now know. Dr. Jeff Kramer was born in Huntington Hospital in 1954, and spent the first few years of his life living upstairs in this building. In fact, his present exam room was his bedroom as an infant. The practice was in the basement, and eventually was moved upstairs when the family moved next door. 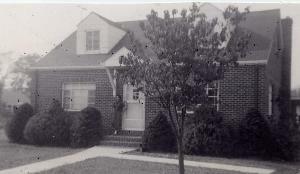 In 1959, the building was expanded to its present structure, and remained the same until 1983, when Dr. Jeff Kramer moved back from Virginia to take over the practice. It has been updated a number of times in structure and equipment. We are very proud of what our practice has become, and of our having served the Huntington community and its four legged family members for over 60 years.